I read Jennifer Torres’s Stef Soto, Taco Queen as an ARC at the end of 2016 and loved it. I was making a list of some of my favorite middle grade characters the other day, and Stef Soto (and her family’s taco truck Tia Perla) came to mind almost immediately. There’s so much to love in this heart-warming debut novel. It’s a must read for middle grade kids and for their taco-loving parents and teachers. Seventh grader Estefania “Stef” Soto is itching to shake off the onion-and-cilantro embrace of Tia Perla, her family’s taco truck. She wants nothing more than for her dad to get a normal job and for Tia Perla to be put out to pasture. It’s no fun being known as the “Taco Queen” at school. But just when new city regulations are proposed, and her family’s livelihood is threatened, she will have to become the truck’s unlikely champion. A wonderful debut that’s sure to be a hit among middle graders. 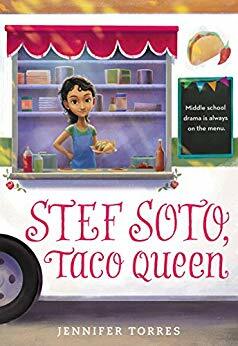 Stef Soto is a perfect middle-grade heroine – determined to get out from under her overly-protective immigrant parents’ thumbs, endlessly embarrassed by the family business (delightful Tia Perla, the taco truck), struggling to fit in at school – and full of love and support for her family and friends. This book is full of great friends, a fun goal, and an authentic portrayal of middle grade life. And tacos! A beautiful book that teachers and students are sure to love. A kid you can totally relate to. Great friendships (and believable rivalries). A true-to-life financial problem that will make for a good discussion topic. STEF SOTO, TACO QUEEN is available now. You can pick up a copy online or at your nearest independent bookseller.